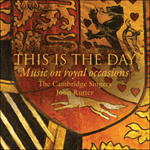 The inclusion of this unaccompanied motet in the 2011 royal wedding by special request brought Welsh composer Paul Mealor to international prominence. His compositional background is solidly academic: early studies with Nicola LeFanu and with Hans Abrahamsen in Denmark have led him to find an individual voice heard in a growing and diverse catalogue of work, which he has combined with a professorship of composition at the University of Aberdeen. Ubi caritas, a specially reworked version of his secular choral piece Now sleeps the crimson petal, shares something of the mystical atmosphere and harmonic techniques of the music of Morten Lauridsen and Eric Whitacre while remaining distinctively his own. In the closing bars a quotation of the Gregorian chant used in Duruflé’s setting of the text creates an appropriate historical resonance.